Homeowners are choosing to remodel instead of buying new homes, and basements are finally receiving the attention they deserve. The most versatile space in the house, a basement can hold video gaming space, extra bedrooms, a 1.75 bath, a handyman’s workbench, a crafting area, the home theater system, a home office, a music room, a laundry room, or a rental apartment just to name a few. But uniform flooring for these rooms doesn’t need to be a designing conflict. 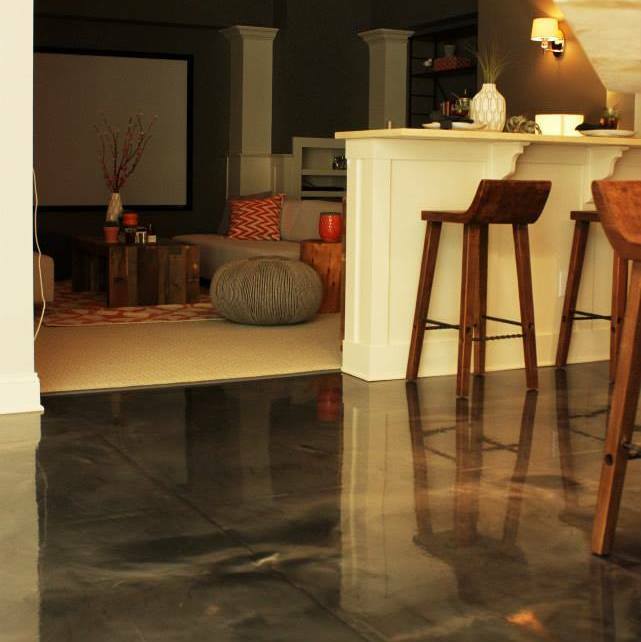 An epoxy coating can add drama and character to a ho-hum, grey cement floor. It’s an excellent solution for a high-traffic basement. Here’s why basement remodelers should consider epoxy solutions for their next renovation. StoneMaxx is an attractive and affordable natural stone overlay to resurface uneven or broken concrete for a superior surface finish. It’s resistant to stains, scratches, and slipping, while easy to keep clean. StoneMaxx comes in a variety of natural stone colors and textures, and because it’s so durable it lasts for years. It’s ready for traffic one day after the installation. Metallics have a smooth, glass-like quality with a subtle sparkle. Because of the way the patina glistens, no two floors look the same. The metallics come in an array of decorative color combinations. Take it to the next level by making the floor look uniquely three-dimensional. Concrete staining gives a mottled, variegated, marble look to the basement floor. Subtle variations of the color is to be expected and the high gloss is part of the appeal. If a quick turnaround is required, a solid-colored, single coating system will save time, offering one-day installation. Concrete staining is ideal for commercial or retail basements, as well. If you live in the Columbus, Ohio area, please contact SealMaxx of Columbus for pictures, color charts, ideas and tips to spark your restyling creativity.